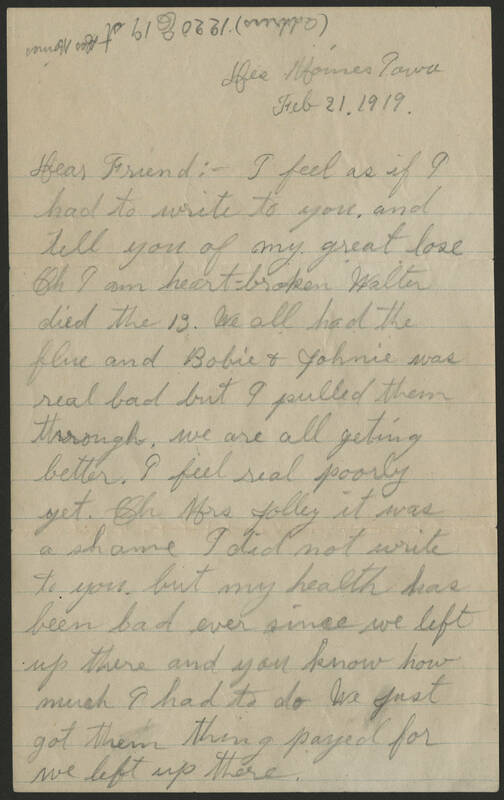 Des Moines Iowa Feb 21 1919 Dear Friend: I feel as if I had to write you and tell you of my great lose. Oh I am heart-broken Walter died the 13. We had the flue and Bobie & Johnie was real bad but I pulled them through. We are all getting better. I feel real poorly yet. Oh Mrs. Folley it was a shame I did not write to you but my health has been bad ever since we left up there and you know how much I had to do we just got them thing payed for we left up there.